Sometimes there are perks to my job. I get to cover some really cool events. Last week, I went over to Biltmore Estate to check out their tree raising. It’s pretty amazing, and I worried this year that the tree would break in half (it was too fat for one of the doors into the banquet hall.) The estate’s main tree is about 35 feet tall. That’s a big tree. And they have to be extra careful getting it into the house – so they don’t touch any of the walls, artifacts, chandeliers, etc. And, of course, there was a photo gallery by Steve Dixon. 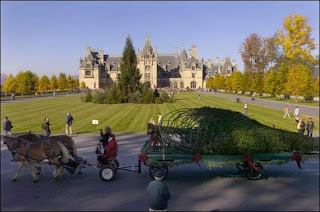 Man, I need to visit Biltmore at Christmas!